Educational marketing is the sweet spot at the intersection of training and marketing, with the same end goal of behavior change. The Challenge: Our client, a large consumer goods manufacturer, discovered that 92 percent of customers wanted a knowledgeable salesperson to sell them products. However, sales associates work in independent stores with many brands to sell, and they’re not mandated to take product knowledge courses from individual brands. The Solution: Create highly engaging educational marketing that makes associates better salespeople. What is the “moment of truth” in sales that can create a happy and loyal customer? For many brands, it is the interaction between the sales associate and the customer. Whether it’s a five-minute call or a half-hour conversation, that interaction is the key to capturing a loyal customer and a successful sale. The sales associate has to know, believe in, and recommend the product based on the customer’s needs. But what happens when the sales associate works for a retailer and has countless other brands from which to choose to meet the customer’s needs? The business challenge is to engage sales associates so they promote your brand first. In other words, you need to win the hearts and minds of those associates. The solution lies at the intersection of training and marketing. These two disciplines each bring their own perspective on motivation, but at the end of the day, they have the same end goal to influence behavior change. Working in synergy, they can create an extremely powerful tool to increase sales: educational marketing, also known as education-based marketing. Educational marketing is often discussed in relation to providing customers educational materials in order to support buying decisions. However, when sales associates are the “extended enterprise” (a non-employee population), an educational marketing program can introduce them to the brand and its differentiators, the product line, and questions to ask to ensure the product is a good fit for the customer. Educational marketing can be any combination of training courses (both online and in person), performance support, and promotional or motivational pieces customized to the specific needs of the sales associates. What Makes Educational Marketing Different Than Sales Training? Consumers are increasingly reading reviews and researching online before making any purchase decisions. Special consumer groups such as Lifestyle of Health and Sustainability (LOHAS) are known for seeking information on products. Educational marketing has gained prominence because of these changes in purchasing behavior. While traditional sales training and marketing typically focus on the features and benefits of a product, educational marketing goes much deeper in providing specific information (i.e., the materials used or its technology). 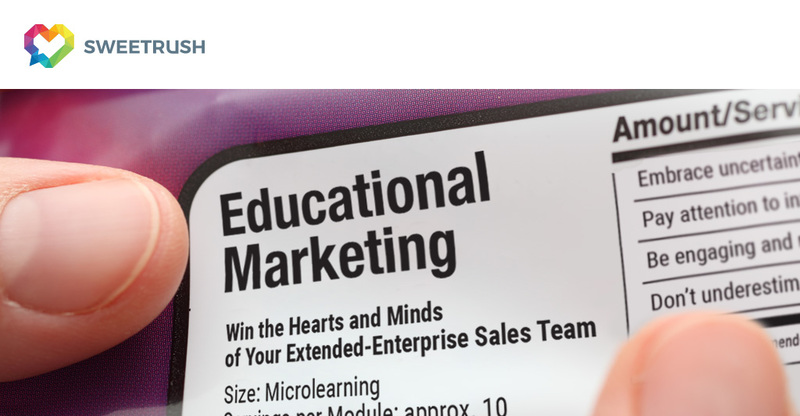 Educational marketing offers tools and resources on how to best use or gain the greatest benefit from the product or service. For example, when providing information about a tire product, our client offers tips on what to do when you get a flat and explains the tire pressure management system. This helps associates be fully prepared when a customer walks in the door—better informed, ready with tips and advice, and more likely to close the sale. Embrace uncertainty and get creative. Traditional analysis doesn’t work in the extended enterprise because you don’t have the same access or control that you have with your employees. Look within your own organization—particularly the marketing department—to yield great information to build your program. Pay attention to intrinsic motivation and “what’s in it for me” (WIIFM). A common challenge in sales training for the extended enterprise is associates not being required to take courses. Many brands encourage associates using extrinsic motivation—tangible rewards (such as jackets, hats, or other merchandise) or even cash incentives. Our client learned that associates are also motivated to take courses for intrinsic reasons: They wanted to be better salespeople. Be engaging and relevant. Typically, sales associates in retail environments are a younger demographic, such as Generation Z, so you need to meet them where they live: online. Competition for their attention is tough—not just from other brands, but from the information age in which we live. You need to stand out from the crowd, be true to your brand, and connect with the audience. Don’t underestimate the power of branding. Match the level of your overall pride and quality as you create the education arm of your brand. Be consistent in your message and presentation of every educational marketing piece you create, including training courses, videos, email announcements, and reminders. In the competitive world of sales, product knowledge alone is not enough to transform associates into brand advocates. Combine the power of training and marketing to create an exciting and authentic educational marketing program to win their hearts and minds. Interested in learning more about SweetRush’s approach to educational marketing? Check out our Branding and Communications page.